PID #28 Enjoy your Pocono Mountain Retreat at this Adorable, Authentic Log Home nestled in a picturesque setting in amenity filled Towamensing Trails. 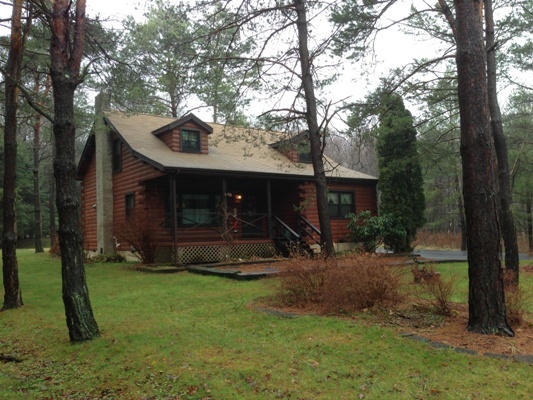 This 3 bedroom 2 bath home is located near many Pocono Mountain attractions such as Major Ski Resorts, Hiking, Skirmish, Whitewater Rafting, Historic Jim Thorpe, Horseback Riding, Biking, Shopping, Casinos, etc. Please inquire for actual rates! For your convenience this home supplies a portable crib, high chair and booster seat. Kids Bedroom is supplied with 32" TV, Air Hockey Table, Assorted games and puzzles. Our homes are supplied with dishes, cookware, pillows and blankets. PLEASE BRING towels, dish towels, linens and paper products. Linen service available upon request and additional fee. This home accommodates 8-10 people. Please do not exceed this number.